Melville Island (Tiwi: Yermalner), known in the Tiwi language as Yermalner, is an island in the eastern Timor Sea, off the coast of the Northern Territory, Australia. 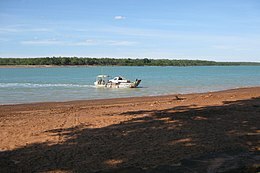 It is west of the Cobourg Peninsula in Arnhem Land and north of Darwin, with a tropical climate. The largest community/town on the island is Milikapiti, pop. 559. The second village is Pirlangimpi (Pularumpi, formerly Garden Point), pop. 440, 27 km west of Milikapiti, on the west coast of Melville Island. About 30 more people live in five family outstations. At 5,786 square kilometres (2,234 sq mi) it is just outside the 100 largest islands in the world, but is the second biggest island in Australia, after Tasmania (and excluding the continental landmass). Only 55 metres (180 ft) south of its southern tip is Irrititu Island, with an area of 1.60 square kilometres (0.62 sq mi). Together, Melville Island and Bathurst Island are known as the Tiwi Islands. It is said that the first European to sight the island was Abel Tasman in 1644. King named it for Robert Dundas, 2nd Viscount Melville, first lord of the Admiralty, who is also commemorated by the much larger Melville Island in the Canadian Arctic Archipelago. Shortly after this, the British made the first attempt to settle Australia's north coast, at the short-lived Fort Dundas. During World War II the small Snake Bay Patrol manned by local Indigenous Australians was established as part of the military forces deployed to protect the island against any Japanese landings. ^ John Woinarski; Brooke Rankmore; Alaric Fisher; Kym Brennan; Damian Milne (December 1997). "The natural occurrence of northern quolls Dasyurus hallucatus on islands of the Northern Territory: assessment of refuges from the threat posed by cane toads Bufo marinus" (PDF). Australian Government and Northern Territory Government. p. 16. Archived from the original (PDF) on 10 April 2011. Retrieved 30 May 2011. Hart, C. W. (July 1930). "The Tiwi of Melville and Bathurst Islands". Oceania. 1 (2): 167–180. JSTOR 40327319. This page was last edited on 21 March 2019, at 06:38 (UTC).